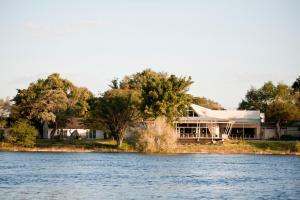 Located on the banks of the Zambezi River, Protea Hotels Zambezi River offers air-conditioned rooms with a flat-screen TV. Facilities include an outdoor swimming pool, a tour desk, and car rental. 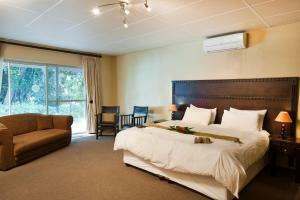 All rooms at Zambezi River Protea Hotels feature a seating area, a work desk, and tea and coffee making facilities. 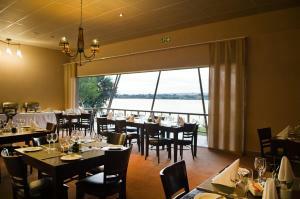 The rooms overlook the Zambezi River or the garden and swimming pool area. Tafule Yaka Restaurant served local and international dishes for breakfast, lunch and dinner. Guests can enjoy a refreshing drink at the Mushabati Bar. 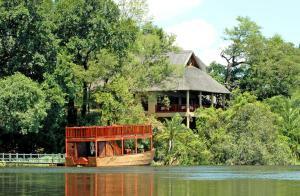 Day trips to the Victoria Falls, Zimbabwe, Zambia, or the Chobe National Park can be arranged. The hotel also offers boat trips, laundry facilities, and a 24-hour reception. 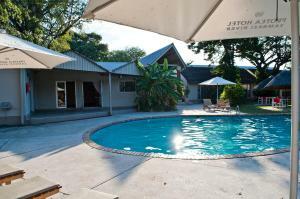 The Katima Mulilo Airport is 21 km from Protea Hotels Zambezi River, and the Salambala Conservancy is 31 km away. Free private parking is available on site. Towering over the red sand dunes of the Namib Desert, this 4-star lodge offers an outdoor pool and a dining terrace overlooking a floodlit waterhole. Its bar serves cocktails and South Africa’s finest wine. 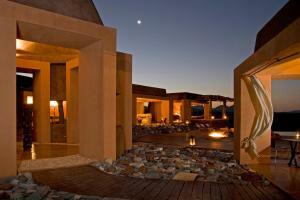 The air-conditioned rooms at Sossusvlei Lodge feature private patios and individual bathrooms stocked with toiletries. Each has a work desk and an electric kettle. Guests can choose between continental and full English breakfast, with scrambled eggs, omelettes and sausages cooked to order. Lunch and dinner buffets include fresh salads, grilled meat and an extensive selection of desserts. The Sossusvlei offers a souvenir shop with books, African jewellery and clothing. There is also a reading room with a fireplace and an adventure centre, which can organise nature drives, hot air balloon rides and more. 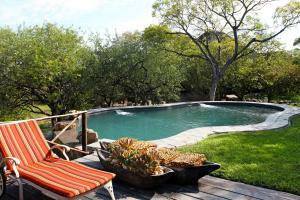 Overlooking the Okavango River, Divava Okavango Lodge and Spa is located 1 km away from the Popa Falls in the Bagani area. The lodge boasts a splash pool, a restaurant and wellness facilities. Each of the luxurious Chalets offers a large deck, air conditioning, a minibar and a four-poster bed, draped with mosquito net. There is a spacious bathroom with freestanding bath and an additional private outdoor shower. 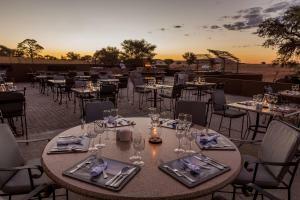 Breakfast and dinner are served at the restaurant or on the terrace, overlooking the Okavango River. Drinks and refreshments can be enjoyed at the bar in the lounge area. For relaxation, the spa offers a variety of massages with 5 treatment rooms and a steam room. Guests at Divava Okavango Lodge can go on boat safaris, or visit the Mahango Game Reserve, which is 10 minutes’ drive away. 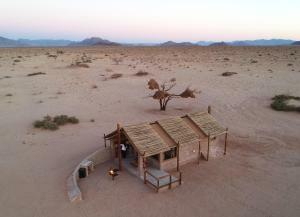 Located in Sesriem, in Namib Desert, Desert Camp offers luxurious self-catering units, with private bathrooms. 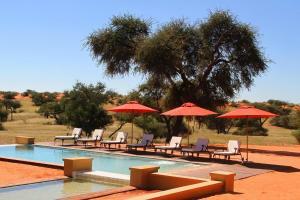 Only 3.1 miles away from Sossusvlei Lodge, it features an outdoor pool with fountain. Desert Camp’s tents have a private entrance and a kitchenette with an electric kettle and a refrigerator. 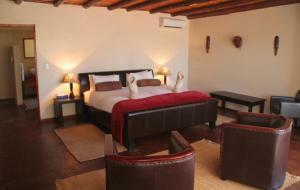 All rooms are decorated with the colours of the Namib Desert and have power points for hairdryers and shavers. Guests can prepare their own meals or use the Camp's BBQ facility. There is also a cosy area for guests to meet together. The carved-wood bar has a large-screen TV for news and sports. 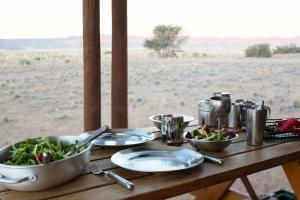 Meals are available at a surcharge at Sossusvlei Lodge, withing 3.1 miles of Desert Camp. 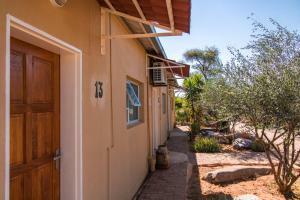 The Sossusvlei Lodge Adventure Centre provides various planned activities, including hot air balloon flights, bird watching, and desert flights. Packed lunches are also available. 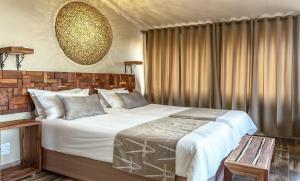 Situated at the foot of the Otjihavera Mountains, Midgard offers modern rooms with views of the lush gardens. It has an outdoor pool with a sun-lounger terrace and children’s playground. The spacious rooms include a satellite TV and a tea/coffee maker. Each has a private bathroom with free toiletries and a hairdryer. Some rooms open onto a private balcony. Carl's Dining Room & Bar serves a selection of dishes and guests can also enjoy a barbecue dinner served around the fire or in the bushveld. There is a gym and a sauna as well as a skittle alley. Other activities available include volley ball, tennis and outdoor chess. Hosea Kutako International Airport is 70 km away. Free private parking is available at Midgard Country Estate. Featuring spacious bungalows and a large pool, Onduruquea Guestfarm is located on 15.000 hectares of savannah, gentle hillsides and dried-out riverbeds. Guests can observe game from their own bungalow. Surrounded by acacias, the thatched-roof bungalows at Onduruquea Guestfarm are directly situated at the riverbeds and near a waterhole. 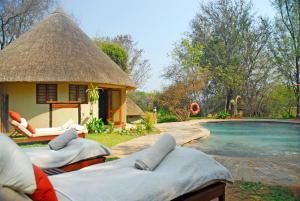 The air-conditioned bungalows are equipped with a minibar and a private bathroom. Guests are welcome to cool down and swim in Onduruquea's pool, which boasts scenic panoramic views of the surrounding landscape. In cooler periods, the warmth of the sauna will be a welcoming treat. Each day, Monika Sibold and her kitchen team spoil guests with a variety of delicacies from the German-African cuisine. Different homemade game dishes are 1 of the cook's specialities. 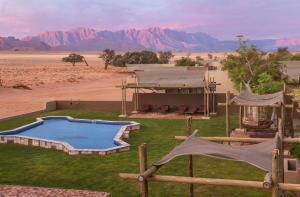 Rostock Ritz features African-style bungalows located along the riverbeds and mountain slopes of the Namib Desert. Built into the granite rock, these bungalows offer panoramic views of the surrounding wilderness. Each room includes a private terrace, ceiling fan and the bed is draped in a mosquito net. The rooms are elegantly furnished and the floors are tiled with stone slate. 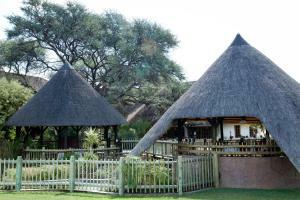 Guests can enjoy a cocktail under the thatched and wooden lapa next to the large swimming pool. A range of activities such as scenic tours of rock paintings and hiking trails are available. The restaurant at Rostock Ritz Desert Lodge offers guests the choice of an à la carte menu for lunch and dinner or a set 3-course meal. Guests are offered a variety of meat, fish, pasta and vegetarian dishes. Both Windhoek and Swakopmund are 240 km from the lodge. Guests are able to make use of the landing strip at the lodge via charter or private plane. 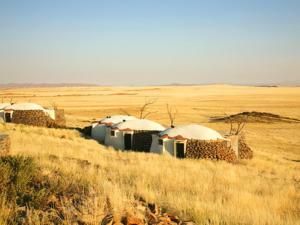 Felix Unite Provenance Camp situated in Noordoewer overlooks the great Orange River. It features a restaurant and WiFi is available in the business centre. Each thatched room is modern and decorated in fresh shades of green. It comes with air conditioning, a fan, tea-and-coffee-making facilities and a minibar. The private bathroom has a shower. 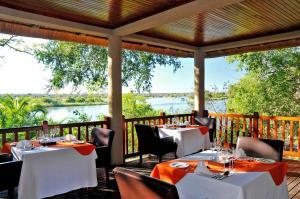 The restaurant at Provenance Camp serves breakfast, lunch and dinner overlooking the Orange River. Barbecue facilities are available for guests to make use of during their stay. Guests can enjoy a refreshing swim in the pool. There is a shop on the premises, and a cash withdrawal machine is available. The Fish River Canyon is 209 km from the camp and the Vioolsdrift Border is 15 km away. 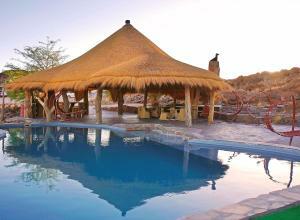 Okahirongo Elephant Lodge is situated in the malaria-free Purros Conservancy, 55 km from the Skeleton coast. 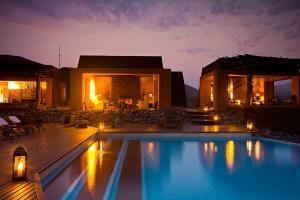 The secluded lodge features luxury accommodation with magnificent views of the surrounding landscape. Uniquely designed, the spacious chalets are decorated with earth and terracotta tones and create a desert-style atmosphere. 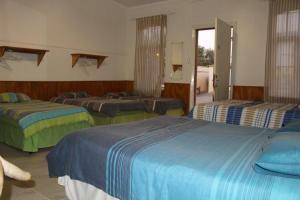 Each chalet has bathroom with bath, indoor and open-air shower. 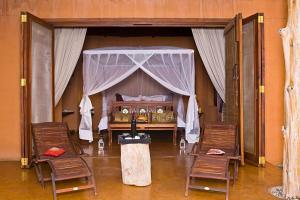 Guests can relax in gazebo with sun beds. 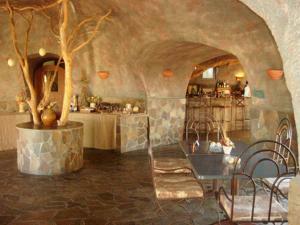 The lodge serves exquisite cuisine with focus on local and Italian inspired dishes and quality wines. 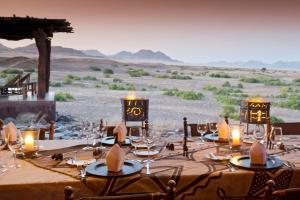 Guests can explore the Purros Valley on a safari, game walk or visit a local Himba village. The lodge's private airstrip is about 5 minutes' drive away and Sesfontein is about 108 km away. Transportation can be arranged. Zebra Kalahari Lodge lies within the Intu Afrika Private Game Reserve and is located within a 1 hour' and 10 minutes' drive from Mariental. The lodge features a bar and sun terrace. The rooms at Zebra Kalahari Lodge have a private entrance and are equipped with a seating area, fireplace and bathroom with a bath or shower. 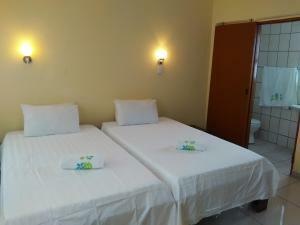 The deluxe rooms offer air conditioning and a terrace. Free WiFi access is available in public areas and guests can unwind at the poolside or bar while viewing the surrounding African bushveld. Meals can be prepared upon request and served on the deck. 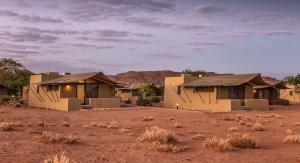 The lodge is nestled within a valley of dunes and activities range from viewing of wildlife to bird watching. 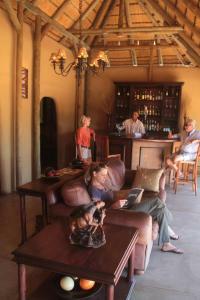 Guests at Toshari Lodge are greeting to the tranquil setting with a welcome drink and refresher towel. The lush garden is the home to many native birds and includes an outdoor pool and herb garden. 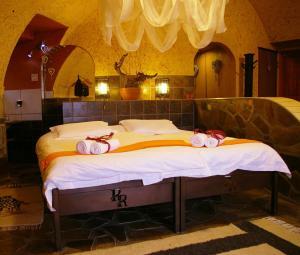 The rooms feature modern African design with dark wooden furniture and beds surrounded by mosquito nets. All contain a private patio with views of the garden and an en suite bathroom. The restaurant prepares a fresh breakfast daily and serves Namibian cuisine for other meals, using home grown herbs and freshly baked bread. There is also a bar with an extensive wine list. The lodge offers guided game drives upon request, and the price includes Etosha Park entry and a freshly prepared packed lunch. 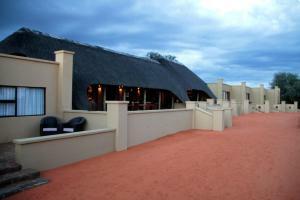 The Toshari Lodge is a 70 km drive from Outjo and just 25 km from the Anderson Gate into the Etosha National Park. 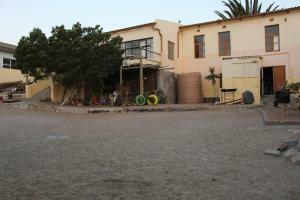 Featuring free WiFi and a barbecue, Element Riders Place offers pet-friendly accommodation in Lüderitz. This hostel has a communal balcony and lounge area. Guests at Element Riders Place have access to a shared kitchen. 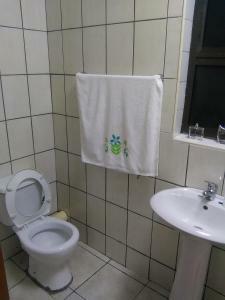 Some rooms have a private bathroom, while others have access to communal ablution facilities. You can play billiards at the hostel and bike hire is also available. Robert Harbour is within a 10-minute walk of Element Riders Place, while Agate Beach is 5 miles from the property. 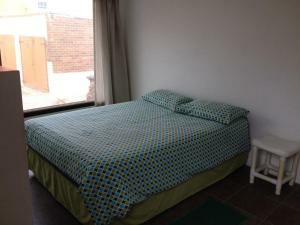 The nearest airport is Luderitz Airport, 7.5 miles from the property. Featuring a swimming pool and a beer garden, Okahandja Country Hotel is situated in a quiet area just outside of Okahandja. Camel Thorn trees and bird life can be found on the hotel grounds. The rooms all feature décor with red and brown accents, air conditioning, a TV and tea-and-coffee making facilities. The en suite bathrooms come with a shower and complimentary toiletries. 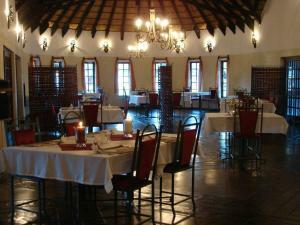 At Okahandja Country Hotel, guests can enjoy meals at the a la carte restaurant. There are also BBQ facilities by the swimming pool and the hotel offers meeting and banquet rooms for special occasions. 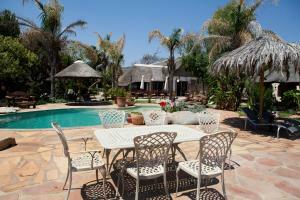 It is a 5-minute drive to the popular Okahandja Woodcarver Market and to Okahandja Railway Station. Midgard Airport is 75 km away. Featuring free WiFi, Capricorn Guesthouse Zambezi is set in Katima Mulilo, within a 5-minute walk of Shoprite Katima Mulilo. Popular points of interest nearby include Pick n Pay Supermarket Katima Mulilo, Katima Mulilo Hospital and Coimbra OK Foods. Attractions in the area include Mavuluma Church, 0.6 miles away, or Tourism & Information (Tutwa), situated 0.7 miles from the property. The rooms in the guest house are fitted with a flat-screen TV. Certain rooms also offer a kitchenette with a fridge. 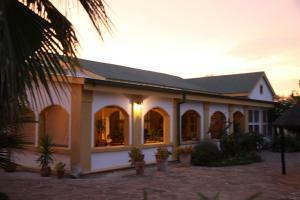 A continental breakfast is available each morning at Capricorn Guesthouse Zambezi. SAAF Club is 0.7 miles from the accommodation, while Cross Border Permit Office is 0.8 miles from the property. Located near Uisib Mountain in northern Namibia, Gabus Game Ranch offers modern and spacious rooms amongst African bushland. All rooms have views of the surrounding waterhole. Facilities available include an outdoor pool and sun terrace. 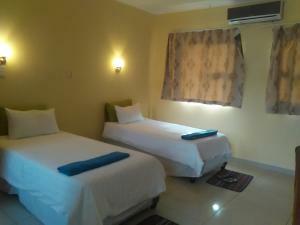 All individually decorated rooms are air conditioned and include a seating area with modern furnishings. 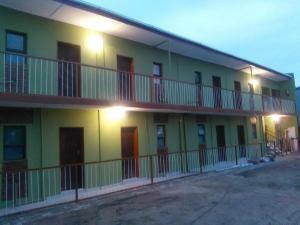 Each has a private bathroom with walk-in shower, toilet and hand basin. Home-style cuisine is served in the restaurant with its high ceilings and exposed wooden beams. A buffet breakfast is prepared daily. Guests can also sit at the adjacent bar with wooden bar stools. Free Wi-Fi is available in the public areas or game drives, hiking and bird watching can be arranged at Gabus. Otavi is only 12 km away by car. Etosha National Park is a 90-minute drive away.